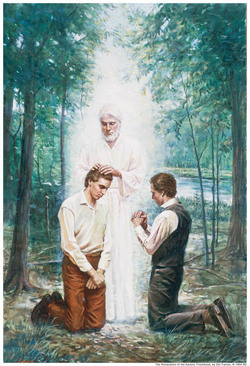 Mormon testified: “It is by faith that angels appear and minister unto men; wherefore, if these things have ceased wo be unto the children of men, for it is because of unbelief” (Moroni 7:37). bring comfort, instruction, and warnings to faithful individuals in times of need (see Genesis 16:7; Exodus 23:20–23; Matthew 2:13, 19–20; 1 Nephi 11:14–15:30; Alma 8:14–18). The Aaronic Priesthood is a great gift of spiritual power that the Lord conferred upon Aaron and his sons. It holds “the key of the ministering of angels and the preparatory gospel” (Doctrine and Covenants 84:26) and also includes “the gospel of repentance, and of baptism by immersion for the remission of sins” (Doctrine and Covenants 13:1). We cannot overstate the importance of the Aaronic Priesthood in this. All of [the] vital steps pertaining to the remission of sins are performed through the saving ordinance of baptism and the renewing ordinance of the sacrament. Both of these ordinances are officiated by holders of the Aaronic Priesthood under the direction of the bishopric, who exercise the keys of the gospel of repentance and of baptism and the remission of sins. In a closely related way, these ordinances of the Aaronic Priesthood are also vital to the ministering of angels. “The word ‘angel’ is used in the scriptures for any heavenly being bearing God’s message”  The scriptures recite numerous instances where an angel appeared personally. 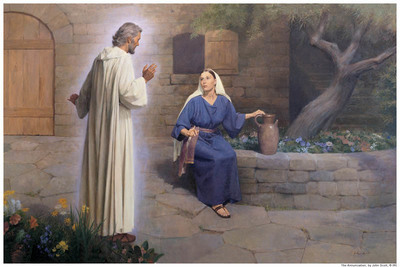 Angelic appearances to Zacharias and Mary (see Luke 1) and to King Benjamin and Nephi, the grandson of Helaman (see Mosiah 3:2; 3 Nephi 7:17–18) are only a few examples. When I was young, I thought such personal appearances were the only meaning of the ministering of angels. As a young holder of the Aaronic Priesthood, I did not think I would see an angel, and I wondered what such appearances had to do with the Aaronic Priesthood. ↑ Larry E. Dahl, “I Have a Question,” Ensign, Mar. 1988, 21–23. ↑ Gospel Doctrine, 5th ed. (1939), 436. ↑ James E. Faust, “A Royal Priesthood,” Ensign, May 2006, 50–53. ↑ George Q. Cannon, Gospel Truth, sel. Jerreld L. Newquist , 54). ↑ Gospel Kingdom, sel. G. Homer Durham , 31. ↑ Dallin H. Oaks, “The Aaronic Priesthood and the Sacrament,” Ensign, Nov 1998, 37. This page was last edited on 27 September 2010, at 22:22.